The Can Am Maverick X3 X RS Turbo R is one of the new 2018 models getting a horsepower boost. 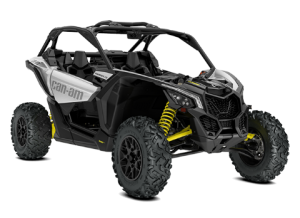 A 120 hp entry level model, the Can Am Maverick X3 Turbo, has been added to the lineup. An entry level crew version was added as well, the Maverick X3 Max Turbo. 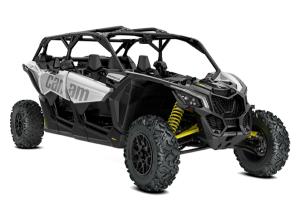 Can Am introduced their new 2018 side-by-side models including a 172 hp Maverick X3 Turbo R model with a 0-60 mph time of just 4.4 seconds. This is a 12% increase in power from the previous 154 hp models. The MSRP for the Turbo R is $22,999. 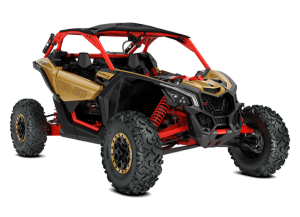 Other models featuring the 172 hp turbocharged engine include the Maverick X3 X DS Turbo R ($24,999) and Maverick X3 X RS Turbo R ($26,899) as well as the MAX/crew versions for all three models ranging in price from $24,999 to $29,399. 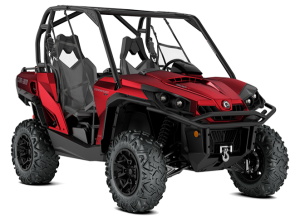 In a sign of the competitive nature and some slowing in the side-by-side market, Can Am also introduced entry level models, the Maverick X3 Turbo and the Maverick X3 MAX Turbo priced at $19,999 and $21,999, respectively. Both of these models feature a 120 hp turbocharged engine. The Can Am Defender Max is a lower priced crew option for 2018. The Defender Max XT Cab features some improved off-road capabilities. Similarly, an entry level crew model was added for the Defender line, the Defender MAX with an HD8 engine option. This model is priced at $12,399 but does not have power steering like the Defender MAX DPS priced at $14,699. Also added to the Defender line for 2018 is a new Defender MAX XT Cab model with the HD10 engine. This model features an enhanced ground clearance of 11″, arched A-arms, larger 220 mm brakes, and a wider 67″ width. 1000R variations of models like the Can Am Commander XT now feature more horsepower with a 92 hp engine. 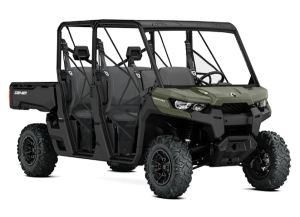 For the Commander line the 1000R versions of the Commander DPS, XT, Limited, Mossy Oak Hunting Edition as well as the MAX crew models receive a boost in engine horsepower from 85 hp to 92 hp as well as larger brakes and a wider stance that is increased to 61.2 inches. The price of the entry level Commander 800R has been reduced $1,000 to $11,199. Can Am is dedicated to rolling out new models on a regular basis. These newest models indicate that the horsepower competition between manufacturers is likely to continue. At the same time, the introduction of lower-priced entry level models show there is a sizable part of the market that is price conscious which manufacturers consider worth pursuing. New entry level models are also another indication of the increased competitiveness in the side-by-side market, which is experiencing both more manufacturers targeting specific market segments, as well as, slower overall market growth compared to just a few years ago. The pie is not growing as fast and there are more mouths to feed. The new Taylor-Dunn G-100 is the first new vehicle in the product line since being acquired by Polaris. 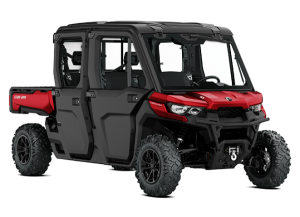 Taylor-Dunn announced the launch of the new G-100 gas-powered off-road utility vehicle co-produced with Polaris. Polaris acquired Taylor-Dunn last year. The G-100 is powered by a Polaris Pro-Star 32 hp engine with electronic fuel injection. The G-100 also features a MacPherson Strut front suspension, dual a-arm independent rear suspension, 9″/10″ of front/rear suspension travel, roof, windshield and four-wheel hydraulic brakes. The G-100 has a 1,000 lb. payload and a 1,500 lb. towing capacity. The G-100 is basically the Ranger 500 with a 2WD rather than 2WD/4WD drive system, as well as different colored bodywork, slightly different front and a roof and windshield as standard equipment. The following are the specs that the G-100 and the Ranger 500 have in common. This addition to the Taylor-Dunn line makes a lot of sense in terms of using the same distribution channel to meet customer needs. Many of the customers that would buy the typical Taylor-Dunn vehicles have a diverse fleet of utility vehicles including those with off-road capabilities. For example, a company campus may have a need for burden carriers inside factories, and utility vehicles for outside landscaping, or a sports stadium could have similar needs. I do know a Polaris GEM dealer that once told me he wish he could sell Rangers as he had demand from his customers for off-road UTVs, but he wasn’t a Ranger dealer so he couldn’t sell them. This does raise the question of how far Polaris can pursue this strategy with Taylor-Dunn. The G-100/Ranger 500 is essentially the bottom of the product line. Will they be rebranding the more capable Ranger models. There is the possibility of creating conflict with some existing Ranger dealers. On the other hand, there is probably not too much customer overlap between Taylor-Dunn and Ranger customers at this point, and many Ranger dealers are more consumer oriented. 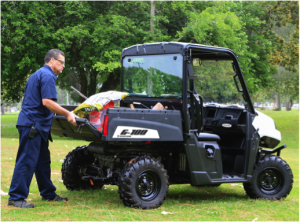 If Taylor-Dunn dealers are successful selling the new G-100 UTV it will validate to a certain extent the Polaris approach of developing a portfolio of small, task-oriented vehicles. Particularly for commercial customers like corporations, parks, universities and the like, the ability to satisfy a wide range of their fleet needs through one dealer should be an advantage in the market. The dealer’s selling efficiency should improve with more opportunities for one-stop selling. Textron is the other vehicle manufacturer that is taking this portfolio approach.